Purdue Veterinary Medicine faculty and staff contributed to two new influential works addressing the topics of diversity in veterinary medicine and protocols for anesthesia and pain management. Both books, published earlier this year, showcase the positive impact PVM scholars are making in these fields. 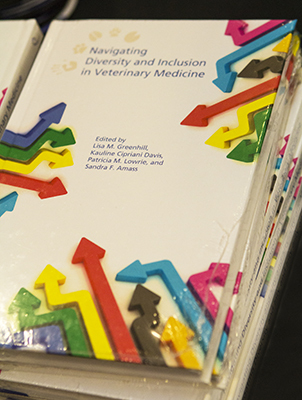 “Navigating Diversity and Inclusion in Veterinary Medicine” is the title of a book published by Purdue University Press that addresses the lack of diversity in veterinary medicine. Edited by a team of veterinary scholars including two Purdue Veterinary Medicine experts, the book begins with the history of diversity in the veterinary profession in the context of historical changes and actions in U.S. society. It also discusses the need for a more diverse scientific workforce to supply the veterinary profession, presents strategies for attracting more students to the profession, and includes best practices from other health professions. The book was co-edited by Sandra F. San Miguel (Amass), Purdue Veterinary Medicine associate dean for engagement and Kauline Cipriani, the College's director of diversity initiatives, with Lisa M. Greenhill, associate executive director for institutional research and diversity for the Association of American Veterinary Medical Colleges, and Patricia M. Lowrie, senior advisor to the dean of the Michigan State University College of Veterinary Medicine and director emeritus of the MSU Women's Resource Center. The team worked with representatives from all aspects of the veterinary profession to compile the book. The book was released at the 2013 Iverson Bell Symposium that was held in March in conjunction with the annual meeting of the American Association of Veterinary Medical Colleges (AAVMC) in Alexandria, Va. 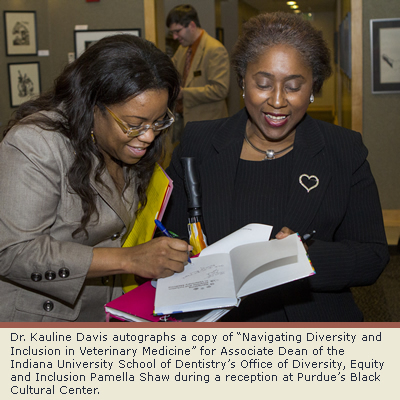 Subsequently, the book was introduced to the Purdue University community at a reception and panel discussion April 10 at the Purdue Black Cultural Center. The panel discussion featured comments by Pamella Shaw, associate dean of the Office of Diversity, Equity and Inclusion at the Indiana University School of Dentistry; Holly Mason, senior associate dean of the Purdue University College of Pharmacy; and Purdue Veterinary Medicine Dean Willie Reed. The book includes a foreword authored by Dean Reed. Other contributors include Dr. Ron DeHaven (PU DVM ’75), AVMA CEO, and Dr. Billy E. Hooper, former PVM associate dean for academic affairs and past executive director of the Association of American Veterinary Medical Colleges. For more information about the book, click here. Senior veterinary students going through their clinical anesthesia rotations found they have the benefit of a recently published full color anesthesiology handbook compiled by Purdue Veterinary Medicine’s own team of pain management experts. Entitled, "Small Animal Anesthesia and Pain Management", the 288 page book published earlier this year by Manson Publishing Ltd., contains nearly 300 illustrations. Led by Professor of Anesthesiology Jeff Ko, the team of six contributors included Assistant Professor of Small Animal Surgery and Neurology Amy Fauber, Clinical Assistant Professor of Anesthesiology Tomohito Inoue, Clinical Associate Professor of Anesthesiology Ann Weil, and Dr. Rebecca Krimins, who was a small animal anesthesia resident when the book was compiled and now is the medical director for Veterinary Imaging of the Chesapeake in Annapolis, Md. Additional contributions came from Dr. Michael Lucroy (PU DVM ’93), a former PVM faculty member who now works for Elanco Animal Health. Dr. Ko says he started on the book three years ago after being approached by the publisher about the idea of compiling a volume on anesthesia for its “Color Handbook” series, which uses many pictures, drawings and diagrams to teach concepts and protocols, in contrast to the format of a typical textbook. As the lead author, Dr. Ko talked with the contributors about their chapters in addition to writing his own sections. Topics covered include everything from equipment to preanesthetic medication, intravenous injection techniques, inhalant anesthetic agents, anesthesia monitoring and management, fluid therapy, airway management and ventilation, acute pain management and euthanasia. Dr. Ko says the handbook proved to be a daunting assignment, because it is designed as a quick reference guide for practitioners and students, using lots of visual aids to “demystify” anesthesia. “It’s really challenging to cover a concept with a picture or illustration, without adding more words than are really necessary,” said Dr. Ko. “We had to find ways to show step by step such things as how oxygen molecules flow through an anesthetic machine and into the patient, and how to do a local block with a local anesthetic agent.” But he says it was well worth the effort. “This book shows the Purdue way of administering anesthesia and providing pain management. It puts Purdue on the map internationally. People will see the Purdue anesthetic protocols and our general philosophy, as well as the quality and complexity of the cases we manage,” Dr. Ko explains. For more information on the book, click here.